Anthony, established on the edge of a beautiful valley in 1878, is everything today that the founders could hope for and more. When Harper County was organized, Governor George Tobey Anthony was given the authority to locate the county seat. 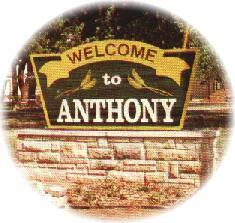 The reward for his choice was to have the town named Anthony. Governor Anthony was a Quaker farm boy from New York who came to Kansas in 1865. In spite of his Quaker background, he served so successfully in the Union army that he was brevetted major for special service at Appomattax. The founders wanted a town that had good schools, churches and a feeling of "community". On that day, they saw the beginning of a community that was rich in agriculture but one that would fulfill the trade needs of its citizens and bring people to Anthony from miles around. The town believes it is providing a quality of life that makes it possible for people to raise their families without fear. Anthony is a pleasant town - a good place to live and bring up a family. It is equally good to retire in. The town has services that can fulfill the needs of all ages. Anthony prides itself on it's hospitality and friendliness. The citizens and entire community invite you to come visit Anthony! Anthony has four public parks with picnic and playground equipment, a ball diamond complex that offers playing fields for all ages, six hard surfaced tennis courts and two outside basketball courts. The lake has been worked on and the water was so low that fishing and boating were basically out of the picture. Due to recent rains the lake does have water in it and is going to be stocked as soon as it \"settles\". The museum is located in the old Santa Fe Railroad Depot. It was built in 1928 and served in that capacity until its closing in 1982. In the fall of 1984, the museum moved into it, thus affording better accessibility for the handicapped and elderly with its ground-level entrances. Anthony, the county seat of Harper County, is justly proud of her stately Court House, constructed in 1908. The building is on the National Registry of Historic Buildings. It is also one of George P. Washburn's 13 historic Kansas courthouses. The Theater is located in downtown Anthony. It features Art Deco and current feature films.